SolaRay radiant heating panels are quick and easy to install needing only a simple electrical installation which is why builders prefer SolaRay heating panels over central forced air heaters. No need to schedule a separate installation of a centralized HVAC system. No waiting for sheet metal work to be completed. No back-framing needed and no mechanical inspection required. Because of the simplicity of installation, it improves your on-time completion and likely will save you money as well with no schedule or cost overruns. Not only are the panels easy to install, but they have a low initial investment. 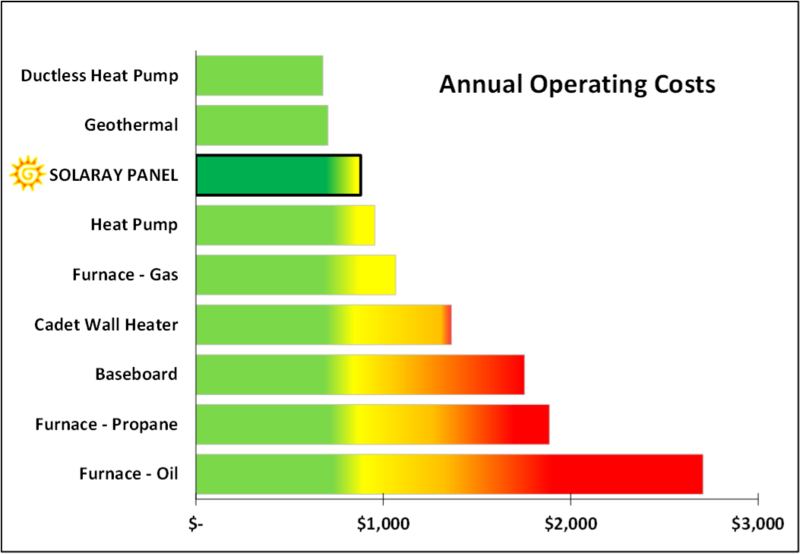 In fact, other than cheap wall or baseboard heaters, there is no heating system with an lower initial cost. 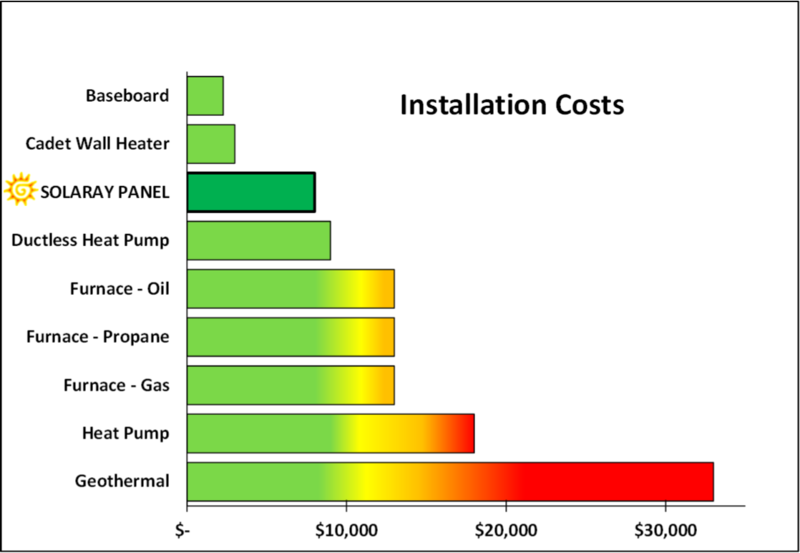 And not only that, but Ducoterra’s SolaRay radiant heating panels have low operating costs and NO maintenance costs. These all add up to increased energy savings and a lower Total Cost of Ownership. Questions about system sizing? Give us a call, or check out our online sizing guide – Panel Sizing in Four Easy Steps! will pay for itself compared to a baseboard heater and in just 7 years compared to a wall heater. Not only that, but over a 30-year life of a home, homeowners would have to replace the wall or baseboard heaters at least 3 times due to their limited lifetime. And often at the worst time, they can burn out in the middle of winter requiring expensive replacement. 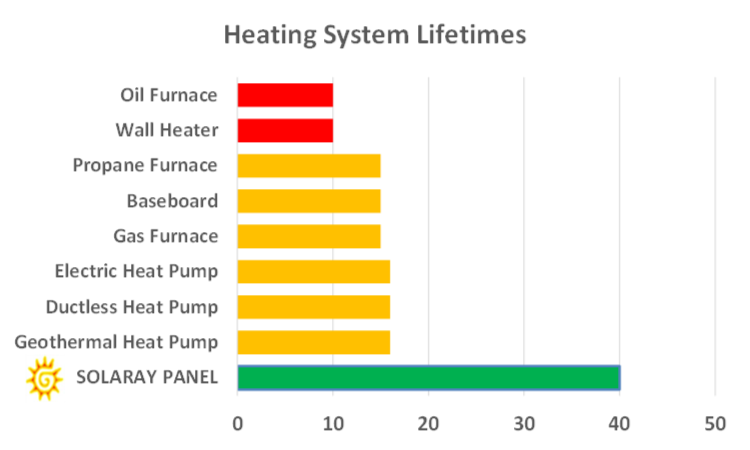 Ducoterra’s SolaRay heating panels also can work hand-in-hand with other systems, like ductless heat pumps, to create a more cost effective heating system while maintaining a high standard of comfort and energy efficiency. 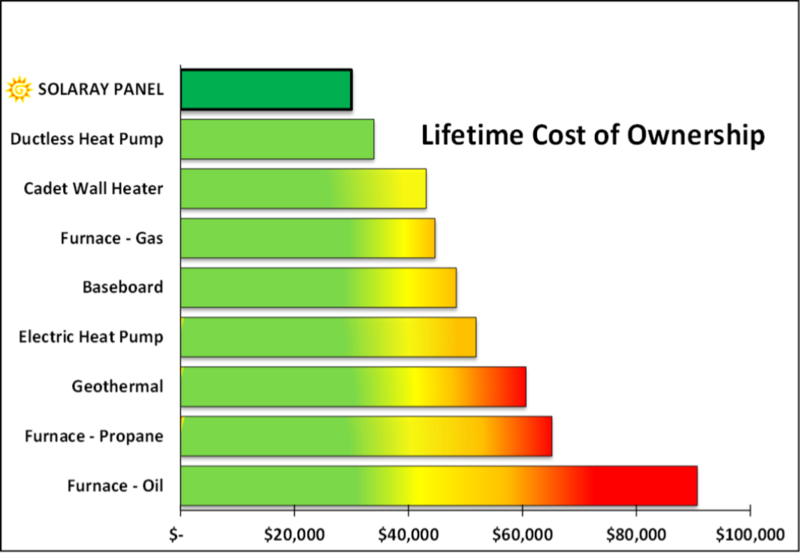 As you can see from the tables above, SolaRay panels are one of the least costly systems to install, other than inefficient baseboard or wall heaters, and are nearly as efficient as geothermal or ductless systems. If you would like to stay abreast of new products and information on radiant heating technology, sign up for our free Quarterly Newsletter. Ducoterra SolaRay panels are UL Listed and come with an industry-leading 20 year warranty. 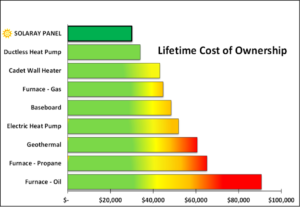 And according to the NAHB, these panels have an expected 40 year lifetime, more than 2 to 4 times the expected lifetime of other heating systems.